If you are a working man or woman and have suffered injury, illness or other medical condition on the jobsite or as a result of your employment, you may be eligible for benefits under the New York's workers' compensation laws. If you have been hurt on the job, you need an experienced attorney to help you navigate the workers' compensation system - you need Jonathan H. Poznansky, Attorney at Law. At the offices of Jonathan H. Poznansky, we focus our practice on helping injured workers navigate the workers' compensation system. For over 27 years, we have dedicated our practice to the representation of employees throughout NYC and particularly Staten Islanders, who have been injured at work. Contact us to arrange a free initial consultation. How will you meet your financial obligations? If you are entitled to workers' compensation, how will you know that you are receiving all that you are entitled to under the law? How long will you be able to collect benefits? Can you return to work and still collect benefits? Can you lose your job? We can answer all of your questions. 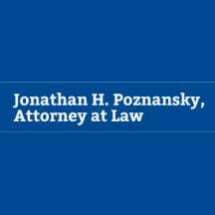 When you contact our offices, you will work directly with attorney, Jonathan H. Poznansky. As a sole practitioner, he will be involved in every aspect of your claim. You will find him accessible, and understanding, while aggressive in his representation of you.